Almighty and everliving God, who didst open the heart of Kateri Tekakwitha, Lily of the Mohawk, to receive the Good News of Jesus Christ, and to devote her life to thy service: grant us the same zeal of devotion to persevere in faith through the trials and tribulations of our lives, through Jesus Christ our Lord. Amen. Almighty and everliving God, who opened the heart of Kateri Tekakwitha, Lily of the Mohawk, to receive the Good News of Jesus Christ, and to devote her life to your service: grant us the same zeal of devotion to persevere in faith through the trials and tribulations of our lives, through Jesus Christ our Lord. Amen. Kateri Tekakwitha, given the name Tekakwitha, baptized as Catherine and informally known as Lily of the Mohawks (1656 – April 17, 1680), is a Roman Catholic saint who was an Algonquin–Mohawk laywoman. Born in the Mohawk village of Ossernenon, on the south side of the Mohawk River, she contracted smallpox in an epidemic; her family died and her face was scarred. She converted to Roman Catholicism at age nineteen, when she was renamed Kateri, baptized in honor of Saint Catherine of Siena. Refusing to marry, she left her village and moved for the remaining 5 years of her life to the Jesuit mission village of Kahnawake, south of Montreal in New France, now Quebec, Canada. 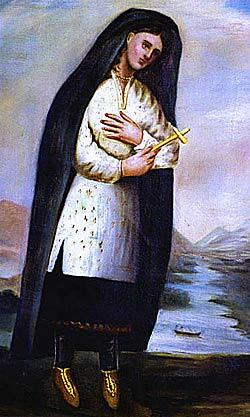 Tekakwitha took a vow of perpetual virginity. Upon her death at the age of 24, witnesses said that minutes later her scars vanished and her face appeared radiant and beautiful. Known for her virtue of chastity and mortification of the flesh, as well as being shunned by some of her tribe for her religious conversion to Catholicism, she is the fourth Native American to be venerated in the Roman Catholic Church and the first to be canonized.